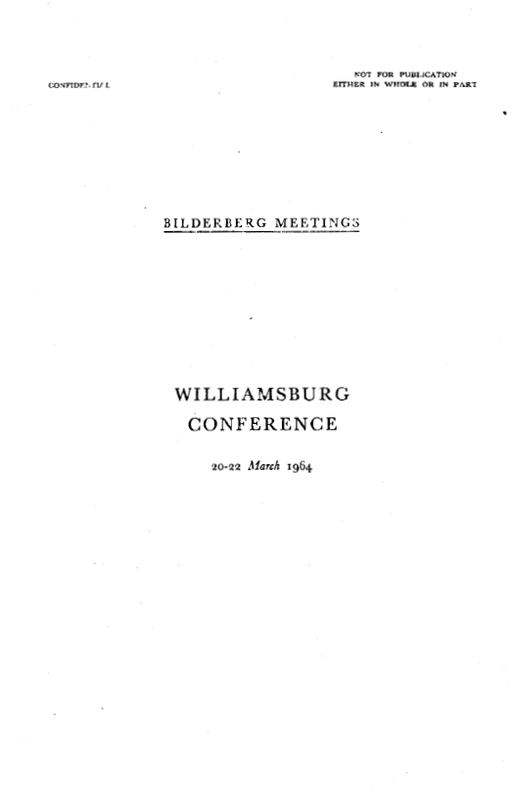 The thirteenth Bilderberg meeting took place on 20, 21 and 22 March 1964 in the United States at Williamsburg (Virginia) under the chairmanship of H. R. H. the Prince of the Netherlands. There were ninety-four participants representing the United States, Canada and eleven West European countries as well as various international organizations, and drawn from leaders in the field of politics (governments and parliaments), business, journalism, public service (national and international), the liberal professions and professional associations. In accordance with the rules adopted at each meeting, all participants spoke in a purely personal capacity without in any way committing whatever government or organization they might belong to. In order to enable participants to speak with the greatest possible frankness, the discussions were confidential with no representatives of the press being admitted. The Prince, however, did receive press representatives on the eve of the conference. (d) coordination of Atlantic Community policy. It should be noted that item III (C) 4. (East-West trade) was dealt with at the beginning of the discussion on Chapter III, more especially because of its connexion with Chapter II and item III (A) 2. This is the chronological order of discussion used as the basis for the present minutes. Additionally, item III (C) 3. (International Finance) could not be dealt with in the time available because of the extensive exchange of views which occurred in respect of other items.